The vast majority of the books I read — 80 to 90% — are review copies. One strategy I have for actually getting around to books about which I’ve heard a great deal but missed on the review cycle is to buy them for a loved one. I bought The Immortal Life of Henrietta Lacks (linked to Nancy’s review) for my dad and ending up borrowing it a year or so later, so that both my daughter and I could read it. It was with that intention that I purchased this book for my daughter for Christmas. 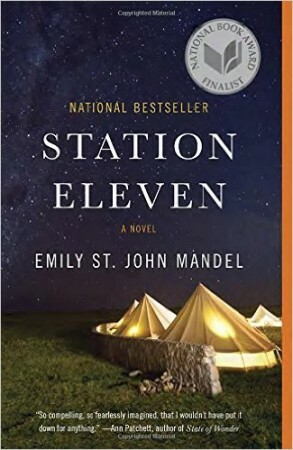 Station Eleven is about a post-apocalyptic world, a world practically decimated by the rapid deaths of 99% of the world’s population from a flu pandemic. One of the central characters is Kirsten Raymonde, a child-actor who was on stage when one of the nation’s most famous actors died on stage while performing King Lear. Kristen was eight when the pandemic hit, spent a year walking with her brother — as many seemed to — so she is one for whom the new reality in Year 20 (20 years after the end of the world) is almost the only reality she remembers. She has vague memories: weren’t refrigerators cold? and did a light really go on when you opened the door? did planes really fly? and phones connect people to one another no matter of location? The present world is a world in which people have to work to survive. After Kirsten’s brother died, she hooked up with a traveling troupe of thespians and musicians who want to give people something else — a bit of beauty — though it seems that the primary effect of their choice is helping themselves retain the sense of identity that their art gave them, as opposed to necessarily sharing their art with others. The cover highlights the surreal nature of this novel and evokes the reality of what life in the traveling symphony would be like — the dark night sky lit up by stars which are not obscured by city lights in a world without electricity — though I think there is a bit too much light in those tents, as compared to how they were actually living. The beginning is exciting and thought-provoking, as the pandemic grinds society to a halt, but then the novel’s pace slows a bit, as the characters are introduced and expanded upon with glimpses of past and present realities. Eventually a common thread amongst many of the characters becomes evident, and the novel ends with a bang because of it. I think that the last 1/2 to 1/3 of the novel was more interesting to me, because there is a bit more focus on what life after the end of the world was like — practically and relationally — for those who have set up a more permanent rather than itinerant existence. This was a National Book Award finalist, and I had first heard of it when it appeared on many “best of” lists at the end of the year (that was probably 2014). With the paperback release in 2015, it gained many new readers. Reviewers who didn’t like the book complain about the impractical reality of life without electricity. Wouldn’t someone work harder to get the world back on the grid? I thought a lot about this as I was reading and even more as I pondered the reviews. Especially in light of the fact that one of — if not the — main character, Arthur Leander, the actor, dies within the first few pages of the novel, it is clear that the novel is about priorities. As those who are left have to focus on survival, it isn’t all that surprising to me that such things as handheld video games and refrigeration aren’t made priority number one. I enjoyed this book a lot, but the electricity thing did bug me. How hard would it be to hook up some solar panels? That was my only nit, though – I did think that the book was really interesting. I listened to it on audio.